In The Hague, housing mostly falls into two categories, flats (apartments) and terrace style houses (Herenhuis). The houses are typically on 2 – 4 levels and offer a reasonable amount of space. Kitchens are typically small and stairs can be steep. Gardens tend to be small. Street parking is common, although some flats have their own car parking arrangements. The Statenkwartier is a stylish area with lots of charm. Here you will find older homes/ apartments with big rooms and high ceilings. Good shops, deli, stores, cafes and restaurants are to be found on Statenkwartier’s main street Frederik Hendriklaan or “The Fred” as the locals call it. Scheveningen is a mix of the old and new style. The seaside promenade with restaurants and shops is a major tourist destination. Public transport by tram/bus is good. Near city centre, walking distance to the Shell offices and well located for public transport by bus. Popular for expatriates of many nationalities, families or couples. 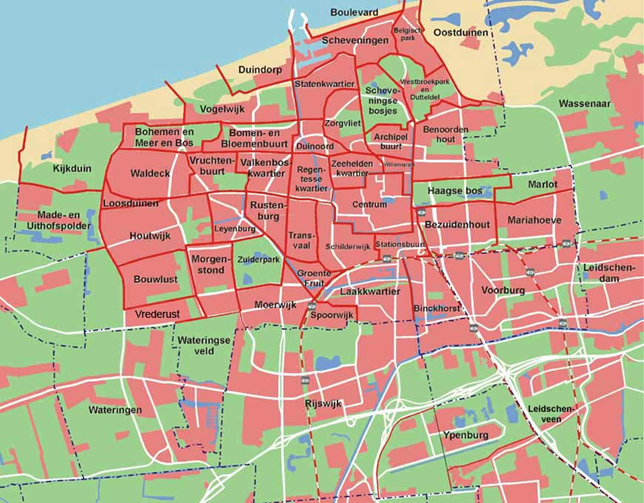 Voorburg & Leidschendam (convenient for The British Junior School at Mariahoeve and the Junior School in Leidschenveen) Also reasonably convenient for the Shell offices in The Hague and Rijswijk. Here you will find a mix of expatriates of different nationalities. Good public transport system. Wassenaar (convenient for The American School) A village with typical Dutch charm, popular within the diplomatic community. The preferred location for families with children at the American school, also popular for the British Senior School in Voorschoten. Houses range from modest to palatial, but expect to pay more than in most other areas. Very densely populated with expatriates! Please note there is no train station in Wassenaar but there is a regular bus service. Shell offices in The Hague and Rijswijk are easy to get to by car or bike. Voorschoten (convenient for The British Senior School and the Junior School in Leidschenveen). Another charming Dutch village on the River Vliet. Excellent train and bus service to The Hague. Oegstgeest (convenient for Rijnlands Lyceum Oegstgeest – TTO, English language IB programme). Convenient to ESTEC- ESA. Still very much a traditional Dutch community, but does attract some expatriates as well. Leiden is an old charming University town, with shopping and nightlife. Trains available to Utrecht, Amsterdam and The Hague. The outskirts of Leiden, (near Voorschoten) are reasonably convenient to Shell offices in Rijswijk, the British Senior School as well as the Junior School in Leidschenveen. Voorschoten 14km 15 – 20 min. Ask friends and neighbours for the current wage scale for domestic help. Your responsibilities as an employer depends on the number of hours required and the type of work. Many expatriates employ a cleaner on a ‘casual’ basis. On a twice a week basis, a cleaner will expect a two week holiday with pay, payment while ill, and a coffee break. It is usual to supply a key for access to the house in your absence. Search in www.telefoongids.nl under Tuinaanleg, tuinarchitect or tuinonderhoud for Landscape Gardeners. For Catering services use word of mouth recommendations or search catering services. If you have acquired live in help, you should prepare a contract stating: working hours, salary, taxes, duties, holiday allowance and possibly social insurance payments. Please check with UWV-GAK The Hague.